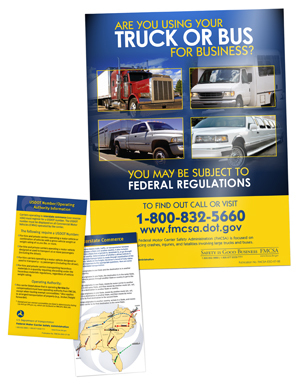 CSS developed for DOT/Federal Motor Carrier Safety Administration (FMCSA) a communications and outreach program to reach non-entrant (unregistered) motor carriers to educate them on the need for regulatory compliance and to improve motor carrier safety on the nation's roads. CSS and FMCSA used the Safety is Good Business message to engage these unregistered motor carriers in a voluntary program and adopt best business and safety practices to reduce their risk of being involved in a crash. CSS developed the FMCSA Safety is Good Business website and created a tool kit of education materials (presentations, posters, brochures, instructions) for distribution to state DOTs, trade associations, and other critical points of contact. CSS also completed a 6-state pilot program to reduce crashes and fatalities within the geographic areas with the highest non-entrant concentrations.